With experienced florists and a dedicated fleet of delivery vehicles, if you are looking for beautiful lilies brought to your home, look no further. At Flower Station, we have a great selection of white, pink and tiger lilies for you to choose from and with free Londondelivery, our prices are unbeatable. Beautiful lilies are one of most popular flower choices in the Uk. They are often used in flower arrangements as well as most of bouquets. 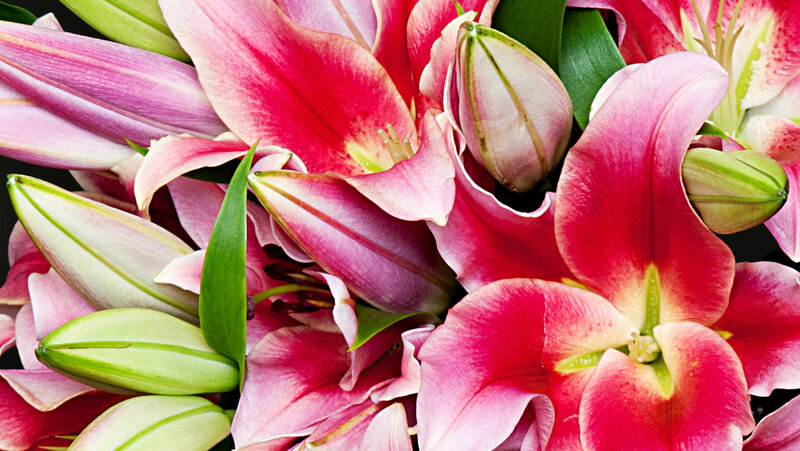 Our selection of bouquets with lilies gives you all you need. Amazing looking lilies bouquets with our lilies delivery service throughout London and in UK. If you cant find the lilies you are after then please give us a call and we will be more than happy to help. MEANING AND HISTORY OF LILIES - Lilies have been cultivated for more than 3000 years. Christians held the lily as the symbol of purity and innocence. The Greeks associated the flower with birth and motherhood, whilst also making the lily into a symbol of high eroticism and sexuality. In France the lily is identified with Fleur-de-lys; with each passage symbolic of 1) royalty, 2) prosperity, 3) expanse. From our London shop and our eco vans we have been delivering these messages all through Greater London and and anywhere else in the UK, always finding an efficient way to your loved one’s door. It is said that dreaming of lilies means that it’s the right time for you to act upon a long sought after aim. And with our premium brand of lilies we hope to help you in this endeavour here at Flower Station, just let us know when. Make the most of our excellent delivery options and send Lilies London wide with our same day delivery. Whether it’s pink or white, Calla lilies or even orange, order by 6pm and we will guarantee same day delivery. For addresses outside the capital we can arrange fast and efficient next day delivery nationwide. Your order will be processed, organized and dispatched quickly for arrival at its destination. We always take paramount care with all our orders and pride ourselves on reliable and well timed deliveries. We are open 24 hours a day, seven days a week so it really is never too late. Whether it is a gift or a bit of selfish indulgence, a bouquet or one of our beautiful potted plants, do not hesitate and order today for quick and reliable flower delivery every time. LILY CARE - All our lilies are grown in Holland where they are grown all year round and as they are delivered directly to us from growers, their freshness is virtually guaranteed. To optimise and capitalise even more on such facts here are a few facts to give your fresh flowers an even longer vase life. Upon receiving you flower delivery cut off the stems at a steep angle and remove any leaves that may fall below the water line. Make sure to change water every day and do add a sachet of flower food on the first day and thereafter on the third day of receiving your flower arrangement. Do keep your lilies away from sunlight and heat. To keep pollen from staining your clothes, do remember to take out the stamen as the lily opens. In case of stains, an effective way to remove pollen is to use sticky tape. Lily pollen is also poisonous to cats, so it is important to check your recipient does not own any before despatching your floral gift. Q. What are the charges for delivery? Q. Are the flowers always fresh? A. We pride ourselves in the freshness of our flowers. We receive fresh commercial flowers from around the world on a daily basis ensuring the bouquet you receive is as fresh as possible. The quality of our flowers and how they last will be a testament to their freshness. Very pleased with the service I received. Would definitely recommend to a friend. Flowers were fresh and last well. Was a bit hesitant to order online as it was my first time but am delighted I went through with it. Chose the AM delivery service and the flowers arrived by 11am in order to catch a client at home. They were delighted. 5 Stars! A real quality florist in the heart of London. Used them for years and never let me down.